Kaltura MediaSpace is an online media hosting/streaming service similar to YouTube. You can use MediaSpace to upload, edit, and share your media with other users. Go to http://stream.langara.ca and click on Login at the top right corner of the screen. From the user menu, click Login. Log in using your Computer User ID and password (e.g. jsmith99). mode, you will see the navigation menu displayed horizontally on the left, with the search box and the user menu at the top right. On a smaller or mobile screen, the navigation menu and search box are collapsed into the top left corner and are accessible by clicking on the “hamburger” menu. Your user menu will still appear at the top right. To upload video to MediaSpace in Brightspace, see Uploading Media. 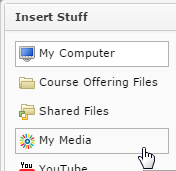 To insert media into your Brightspace course, see Sharing Media in Brightspace. Log in to MediaSpace and click on Add New. From the menu, select your preferred method of adding media. 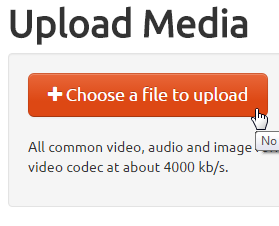 Media Upload is used to upload a video or audio file from your hard drive to MediaSpace. Click on the Add New button and select Media Upload. On the Upload Media screen, click the “Choose a file to upload” button. Locate the file on your computer. Once you have added the file, you will see a progress bar indicating the progress of your upload. 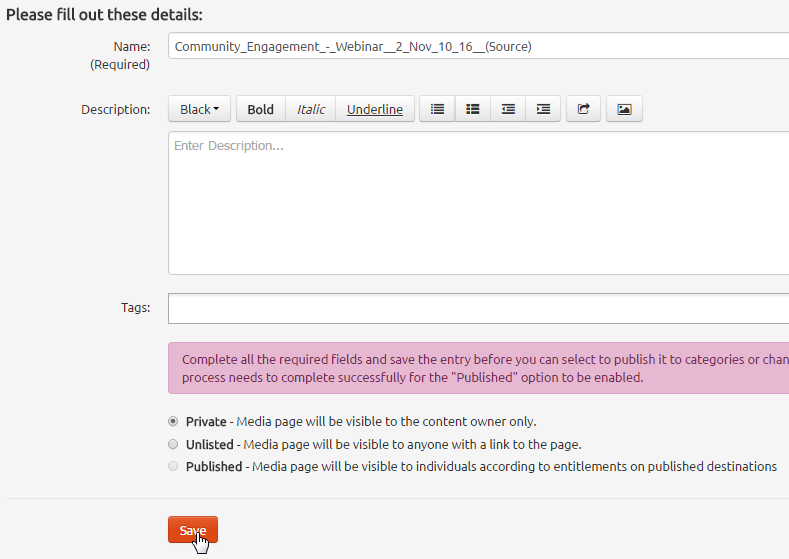 Once it’s finished, you will see the words “Upload completed!” and several additional fields will appear below. You should always fill out as much information about your video as you can, but make sure to include a Name and any tags that might help you find the video later (like the class name and number – e.g. ENGL1117 – the semester in which you uploaded the video, or a description of the subject matter). Note: New uploads are set to Private by default. Once you have saved your media, you will be given the option to keep it Private, or to set it to Unlisted or Published, or add it to one or more Channels. For more information on sharing and publishing videos, click here. Make any desired changes, and then click Save again. Click on Add New and select CaptureSpace. Click here for instructions for using this application. Note: CaptureSpace requires the download and installation of a desktop application, and only works in Windows or Mac environments. Note: New uploads are set to Private by default. To set publication status on your CaptureSpace videos, you will need to select the media in My Media, and select Publish from the Actions menu. Click on Add New and select YouTube. MediaSpace allows users to index public YouTube entries in MediaSpace. 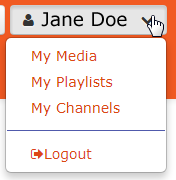 Media can then be published to channels, added to playlists, or otherwise shared with other users. In the Video Page Link field, simply type or copy-and-paste the URL of a YouTube video (Note: the YouTube import tool only supports public YouTube videos). Click Preview. Play the YouTube video to verify your choice. Then fill out the details in the fields that appear below. By default, the Name and Description fields will auto-fill with the information from the original YouTube video. 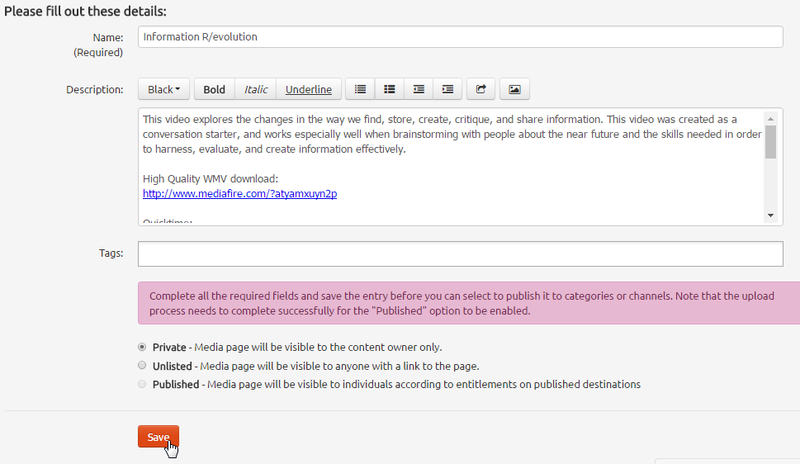 Make any changes you wish to make, set the publication status of the video, and click Save. You can grant permission for other users to download the media you upload to MediaSpace. Note: This feature is not available in Brightspace. 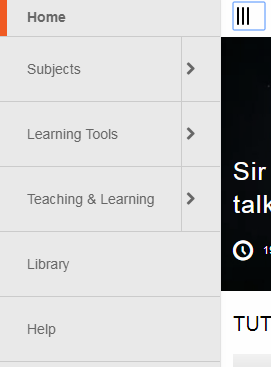 New uploads are set to Private by default. Once you have saved your media, you will be given the option to keep it Private, or to set it to Unlisted (which are not searchable, but can be shared with other users by giving them the URL) or Published (which can be made available to other users via Channels or playlists). Note: If you plan to embed the media on iWeb, CourseWeb, or another site, by using the Share button and copy-pasting embed code, it is not necessary to set media to Published. The embed code method overrides all other privilege settings. 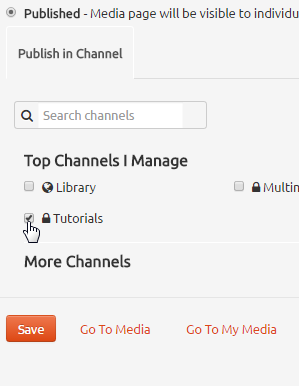 If you wish to add the media to a channel, click on Published and choose the channel from the list that appears below. 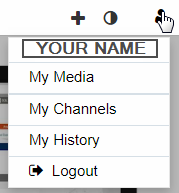 You can now click Go To Media to view the media, or Go To My Media to see the media listed with your other files. Adding media to a Brightspace course using My Media is a 2-step process. First, upload the video to your My Media (My Tools > My Media). For instructions, see Uploading Media. Then read the instructions below to learn how to insert the video in your course. In Brightspace, you can insert Kaltura videos anywhere you find the HTML Editor. In the HTML Editor, click the Insert Stuff button. The Insert Stuff window will appear. NOTE: If you attempt to embed a media item immediately after uploading, it may still be processing and therefore will not be found when you search for it. Allow for processing time before attempting to insert media files in your course, especially if you have uploaded a large file. In the Insert Stuff window, select My Media as the source. To find videos you have uploaded to Kaltura, you must perform a search. NOTE: Click Search without entering anything in the search field to bring up all of your Kaltura videos. Once you have found the video you want, click to select it. Next you will see a preview of the video as it will appear in your course. You can play the video to ensure it’s working correctly. When you’re done, click Insert to insert the video into your course. The Insert Stuff window will close, and you will be able to see the embedded video inside the HTML Editor. Make any further edits you wish to make to the content item (adding text, etc. ), and then save and close. The video will now appear in your course. NOTE: Kaltura videos and Assignment folders – If you are inserting a video into an Assignment folder, first upload the media using My Tools > My Media, and then embed the video in the HTML Editor of the Assignment folder using the Insert Stuff button. Do not attempt to use “Add a File” to upload your Kaltura video. Note: The Share button will only appear if you are logged in to MediaSpace. Note: Sharing with these methods will override any privacy settings on the video; e.g. a Private video will still be viewable. MediaSpace allows you to assign new owners to your media, as well as granting editing and publishing rights to other users. Note: Collaboration settings are not available in Brightspace. Note: Changing the media owner will remove the item from your My Media and remove all of your rights to the item. You can grant editing and publishing rights to other users. A Co-Editor may make changes to the original media item and its settings. A Co-Publisher gains the ability to Share the file and publish it elsewhere, but cannot edit the file itself. Playlists are personal collections of media items; you are the only one who can add and remove items from a playlist. Playlists can be shared with other users or embedded outside of MediaSpace, and can be accessed from User Menu > My Playlists. Browse to the media that you would like to add to a playlist. After you’ve created the playlist, you can preview it, reorder media in the playlist, and copy the playlist’s embed code. Tags are used across all levels of organization. Tags can be used on an individual basis, for your own private collections, or standardized across public or shared collections, e.g. “Library” might be applied to all videos posted by Langara Library. All tags on published videos are added to MediaSpace’s tag collection, which means that they will appear as suggested tags on all new videos, allowing users to cross-reference public videos without using Channels.